Akron Ohio Law Firm, Pavick & Pavick L.P.A. The law firm was founded in 1950 by Michael J.Pavick who served as an Assistant Attorney General representing the State of Ohio in workers’ compensation cases. He became one of the state’s top litigators. Mr. Pavick’s achievements were noted by Governor C.William O’Neil who appointed Mr. Pavick as a Commissioner to the Ohio Industrial Commission in 1957. As a Commissioner, Mr. Pavick brought reforms and improvements to the workers’ compensation system on behalf of injured workers and employers. He was actively involved in sponsoring major changes to the workers’ compensation system including the 1959 legislative act and numerous safety programs. He was reappointed as a Commissioner by Governor Michael DiSalle. In the 1970’s Mr. Pavick was appointed by Governor James Rhodes to the rehabilitation study committee which committee’s recommendations led to the establishment of the first comprehensive rehabilitation program for Ohio injured workers in 1979. Over the years, Mr. Pavick litigated numerous workers’ compensation and personal injury cases on behalf of injured people including cases in the Ohio Supreme Court. Walter Dworakowski joined the law firm in 1956. Mr. Dworakowski immigrated to the United States after World War II. As a lawyer in Poland during the war, he was held as a prisoner of war by the Nazis and painfully learned first-hand the need to vigilantly guard and protect the freedoms and justice system of citizens. Upon arriving in the United States, Mr. Dworakowski attended law school and became an attorney in Ohio. Mr. Dworakowski’s areas of practice included immigration law, international law, corporate law and probate law. Mr Dworakowski was active in the Polish National Alliance (PNA), the eighth largest fraternal organization in America where he rose to the prominent executive position of Censor. He was recognized with service awards from President John F. Kennedy and from President Lyndon B. Johnson. He was also appointed as Special Counsel for the State of Ohio. Dean G. Pavick joined the law firm in 1980 after previous employment in the litigation departments of law firms in Cleveland and Columbus. 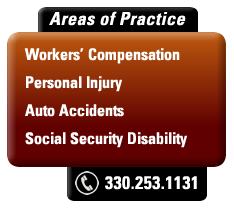 Mr Pavick’s legal practice is concentrated in the areas of workers’ compensation, personal injury, social security disabilty and employment law. Mr. Pavick has litigated numerous workers’ compensation, personal injury, automobile accident, premise liability and other negligence/tort cases on behalf of injured people including cases at the appellate level and Ohio Supreme Court. He has represented a large number of claimants over the years at administrative hearings before the Ohio Industrial Commission and at hearings before Administrative Law Judges in Social Security Disability claims, including appeals to the Appeals Council and in to Federal District Court.He has also occasionally represented small employers in workers’ compensation cases. Mr. Pavick is past chairman of the Social Security Section of the Ohio Academy of Trial Lawyers (OATL), past member of the OATL Board of Trustees, past chairman of the Workers’ Compensation Committee of the Akron Bar Association, a member of the OATL workers’ compensation committee, past member of the Ohio State Bar Association’s original subcommitte on workers’ compensation certification as a specialist, a long time member of the Ohio State Bar Association’s workers’ compensation committee and past chairman of the Akron Bar Association’s Unauthorized Practice of Law Committee. He has also served on a number of other bar association committees. Mr. Pavick has chaired legal seminars for the Ohio Academy of Trial Lawyers and the Akron Bar Association.He has been a faculty lecturer for the National Business Institute in the area of workers’ compensation. He has lectured on workers’ compensation for the Akron and Ohio State bar associations, the Ohio Academy of Trial Lawyers, the University of Akron School of Law and various CPA societies. Mr Pavick is a member of the Akron, Ohio State and American bar associations, the Ohio Association For Justice (OAJ) and the American Association for Justice (AAJ). He has also been a member of the Summit County Trial Lawyers, the New York State Trial Lawyers Association, the Federal Bar Association, Phi Alpha Delta Law Fraternity, and the National Organization of Social Security Claimants’ Representatives (NOSCCR). He is admitted to appear in all Ohio courts, the U.S. District Court for the Northern District of Ohio, the U.S. Court of Appeals for the Sixth Circuit and the Supreme Court of the United States. Mr. Pavick has been recognized by the National College of Advocacy and was presented with the Distinguished Service Award by the Ohio Academy of Trial Lawyers. The name of the law firm was changed to Pavick & Pavick in 1981 and became incorporated as Pavick & Pavick, L.P.A. in 1992. Dean Pavick is the current president of the incorporated law firm.